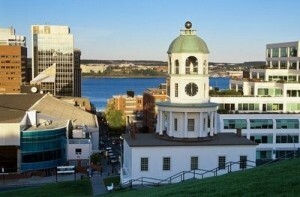 Halifax’s Town Clock is one of the city’s most recognizable landmarks. The Georgian-era clock sits at the base of Citadel Hill, facing out to the harbour. Plans for its construction were put into motion by Prince Edward, Duke of Kent, before he returned to England. Prince Edward was always fond of exquisite clocks, so it was an appropriate gift to the city. Some say he hoped it would help the Halifax garrison improve their punctuality. The three-storey turret clock sits on a very ordinary white building as its base. It went into service in 1803 and has kept time for Halifax ever since. The original clock mechanism, made by noted London clockmakers the House of Vulliamy, is still in service. Three weights and a pendulum measuring 13 feet sit inside, just below the belfry. Its chimes ring out on the hour and every 15 minutes. The clock used to be maintained by a caretaker, who lived in a residence inside the tower, but that position stopped in 1965. Employees of Citadel Hill now come to wind its mechanism twice a week. The exterior was restored in 1995 and the clock face itself was redone in 2005.